This lesson will walk you through the process of linking/pairing Placement Candidates to Institutional Advisors at your institution. Before setting up the placements, you will first want to create a candidate-institutional advisor pairing list in an Excel spreadsheet or Word document so that they are easy to import into your Chalk & Wire system. If you do not have many to enter, you can do this manually if you prefer. NOTE: Institutional Advisors are "assessors" in Chalk & Wire. Candidates are "students". 3. 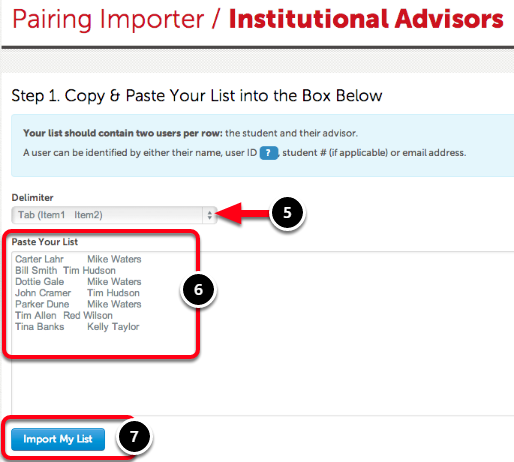 Select the Advisors tab to access the Institutional Advisor Pairings screen. 4. Click on the Bulk Update Pairings button. 5. Use the Delimiter drop-down menu to select your delimiter type. If you are copying your list from an Excel spreadsheet, select the "tab" option. If you wish to type in the pairings manually or if you're copying your list from a Word document, you should use the "comma" option. 6. Paste or enter your pairings into the text box. Only the actual pairings (student/advisor) should be entered - ensure that you do not paste/enter column headers that you might have used in your spreadsheet or file. 7. Click on the Import My List button. Your pairings list will appear on the screen in two columns. If you notice any errors in the pairings or spelling of the names you can use the Go Back and Edit List option at the bottom of the screen to make the necessary changes. 8. Identify the first column as either being the Student or the Institutional Advisor. 9. Click on the Save List button. What Will Happen if I Edit/Change the Institutional Advisor? The Placement will show the name of the Institutional Advisor who was associated with the Placement when it happened. If any assessments or surveys were completed by the Institutional Advisor, they will still appear as the Assessor/Respondent. The Placement will update to include the new Institutional Advisor and will not include the old Institutional Advisor. 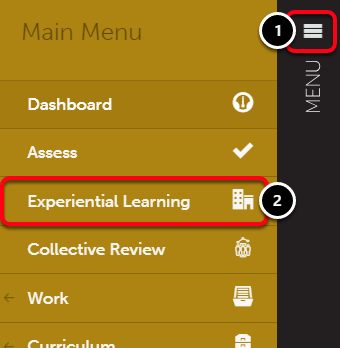 Any planned assessments or surveys will be sent to the new Institutional Advisor. If there are planned assessments and/or surveys assigned to the Institutional Advisor that have not yet been sent, the new Institutional Advisor will recieve them. If there are planned assessments and/or surveys assigned to the Institutional Advisor that have already been sent, the updated Institutional Advisor will be added to the Placement as a Stakeholder. 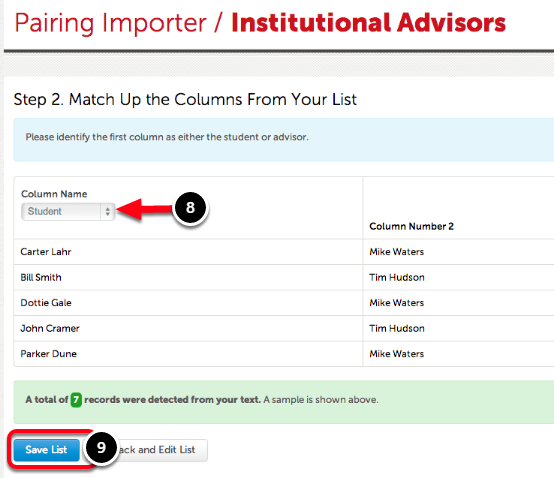 Any planned assessments and/or surveys that are assigned to the old Institutional Advisor will be duplicated. The duplicates will be assigned to the new Stakeholder. Both users may complete the assigned planned assessments and/or surveys.